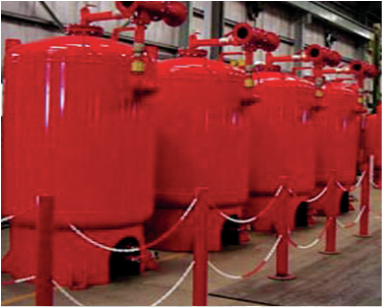 USA Department of Transportation (USDOT) certification for the testing and re-certification of fire fighting and compressed gas cylinders in Kuwait. NAPESCO's Quick Fire Fighting Response Team handles all emergency fire systems maintenance service requirements. On-call 24 hours a day, 7 days a week, ready to respond. The ozone layer forms a thin shield in the stratosphere, protecting all life on earth from the sun's harmful ultraviolet radiation. Chlorofluoro- and bromofluorocarbons are the main cause of the alarming rate of destruction of the ozone layer. Halons 11211, 1301, and 2402, which are fully halogenated chemicals that have relatively long lifetimes in the atmosphere, are broken down in the stratosphere, releasing reactive bromine that is extremely damaging to the ozone layer. The ozone depleting potential of halons is 3 - 10 times greater than that of CFCs. Depletion of the ozone layer is a major environmental concern both nationally and internationally. in recent years, Kuwait has made significant advances in trying to phase out and manage those substances that contribute to the depletion of the ozone layer. This strategy outlines Kuwait's commitment to the effective management of our halon stocks until a complete phase out of the use of halon can be achieved. In its dedication to take part in the international drive for environmental protection of the ozone layer, the State of Kuwait has joined the Montreal Protocol (23/11/1992) in the implementation o a HALON Management Program.